petição: Carson & Barnes Circus Has Forced Elephants to Perform for Generations. It's Time They Stop. Carson & Barnes Circus Has Forced Elephants to Perform for Generations. It's Time They Stop. URGENT UPDATE! Carson & Barnes Circus is currently traveling through Texas and will be in Houston at the West Oaks Mall on March 21 - 24. Please sign and share to stop this cruel animal event! 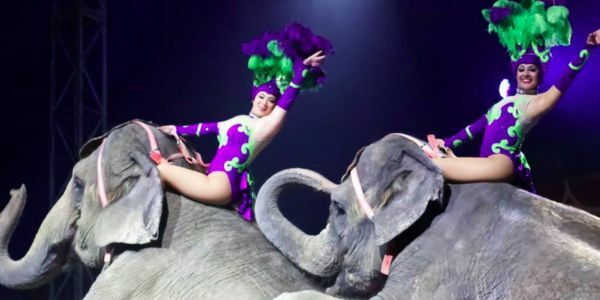 "Deplorable that in 2019 this circus still has endangered animals being exploited and abused. Shame on them and anyone who visits! Retire your elephants!" That's just one of many 1-star reviews given to the Carson & Barnes Circus which now reigns supreme as "the World's Biggest Big Top Circus" now that Ringling Brothers and Barnum & Bailey Circus has collapsed their big top. Ringling Brothers closed in May of 2017 after years of public pushback regarding the treatment of their circus animals, specifically their elephants. C&B's newest show is dubbed Circus Saurus. The name is fitting, since they are a true dinosaur when it comes to their use of animals in entertainment. Due to public pressure and changing opinions on the treatment of animals, cities and states around the country have been passing legislation banning such spectacles since the 90's. But C&B refuses to give in. Instead, the "entertainment" company has continued to take their show on the road, forcing their elephants and other animals to do cruel and grotesque tricks on stage for human enjoyment. Animals are not entertainment, they have their own will and desires and deserve to live a life free from cruelty — preferably in the wild where they belong. Circuses, magic shows and aquarium spectacles that use live animals reduce living, breathing beings to objects that can be forced to do as we want, when we want. It's not only cruel it is wrong. Despite being named one of the worst circuses in the world by PETA, and despite a slew of animal deaths and animal cruelty allegations Carson & Barnes continues to perform all over the country. And, thus, their animals continue to suffer. It's time to leave this form of entertainment in the past where it belongs. Sign the petition and tell C&B's owners, Barbara and Geary Byrd to stop using wild animals in their circuses.